(don't worry buddy, I won't say which one) like a fine wine, you just get better with age!! Not only with what you have done with the course, but also your attitude in life and what you bring into it.....Your the bomb!! Keep up the good work. Jeff, Josh, Dad and I have had many a conversation of projects that need be done, along with things we would like to have done.... all of which are on the planning board. Our heads are spinning.....but as Jeff said "one at a time Deb", and that's the motto for the new year! Poor thing is in so much pain she had a difficult holiday season. But they finally set a date, and she is scheduled for next week. We all send our love and prayers for you girlfriend....you'll be good as new soon! Don't worry, we will make him tow the line! We had a temporary reprieve over the holiday season, the snow melted, the sun came out, and a couple of die hard golfers stopped and wiped the cobwebs out of their swing. As for me......I snuck away for a couple days for New Years Eve. We made our annual passage across I90 and shuffled off to Buffalo. A couple of days with our friends Kimmer, Marc and Uncle Mahoney is just what I needed to relax a bit and think about the up coming year. St. Bernard East?!... why not! 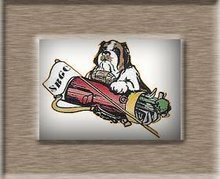 I due believe that there is a St. Bernard G.C. hat hanging among the many paraphernalia at the world famous Anchor Bar Inn (home of the original Buffalo wings) Thank you my friends.....love you all!! It's time for me to ruin my FIRST (and probably last) manicure that my friend Kimmer treated me to for Christmas....those lovely evening gloves I spoke of earlier are calling my name, and the kitchen needs some attention. First up.......the DEEP FRYER.... Oy!